Jamarah Amani is a community midwife who believes in the power of birth and that every baby has a human right to be breastfed/chestfed. Her mission is to do her part to build a movement for Birth Justice locally, nationally and globally. A community organizer from the age of sixteen, Jamarah has worked with several organizations across the United States, the Caribbean and in Africa on various public health issues, including HIV prevention, infant mortality risk reduction, access to emergency contraception and access to midwifery care. She is currently the director of Southern Birth Justice Network, a 501(c)3 non-profit organization. 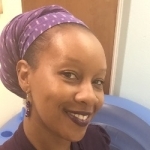 Jamarah studied Africana Studies, Women’s Studies and Midwifery at centers of learning such as University of Pennsylvania, Clark Atlanta University and, most recently, International School of Midwifery. Jamarah is also a Certified Lactation Consultant. In addition to raising four lively children (who are also raising her), Jamarah offers midwifery care, breastfeeding consultations and childbirth education to families and communities across the state of Florida. Jamarah is the 2016 recipient of the MANA Sapling Award. Black low‐income women have a higher primary c‐section rate (first‐time mothers) than any other group. In the United States, Black women are almost four times more likely to die from pregnancy-related causes than white women. Black babies are more than twice as likely to die in the first year of life as white babies. According to Amnesty USA, these are human rights violations. How do interpersonal, institutional and internalized racism impact life and death in our communities? How do barriers such as poverty, immigration status, economic disparity and various forms of discrimination affect an individual's ability to receive quality reproductive health care? Given this context, what is the responsibility of midwives Who have historically been advocates for and caretakers of people from marginalized communities?